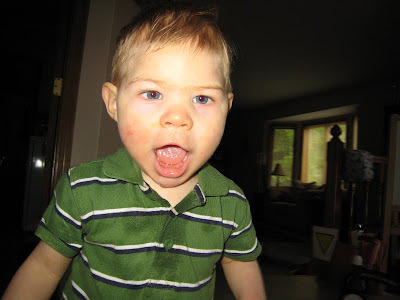 Elijah has been doing really great in speech therapy lately and we're seeing changes in the way he is using his mouth. His tongue is moving around a lot more, he's starting to stick his tongue out a bit, he's closing his mouth some, he's attempting to chew, and he seems to have a better general awareness of his mouth. Eating fascinates me. It seems like such a simple thing to do and might I add…I'm really good at it (but that's a whole other topic!). Eating really isn't as simple as it seems, however. Have you ever stopped to think all the things that you do in your mouth just to take a bite of food? It's phenomenal. And along those same lines, have you ever thought of all the things that your mouth has to do in order for you to speak? It's not a simple task; it's exceptional what we do with our mouths. Read this aloud (if you like – and if it won't make you seem like a crazy personJ) and think of all the positions your tongue, your lips, etc. are in just so that you can talk. It's really amazing. Today in therapy, Elijah ate mandarin oranges for the first time in his life. His therapist was working on getting him to bite off food and eat it. I was pleasantly surprised on how well he handled the chunks he bit off. His little mouth was working! I could see his adorable little dimples as he worked the oranges around in his mouth and down his cute little esophagus. I was mighty proud over some silly little pieces of fruit. As Elijah and I left therapy today, his therapist mentioned that Elijah is making a lot of progress. She said she's noticing him making a lot more noise (Andy and I have been noticing that too). She also mentioned that as his eating skills improved, she thought his speech would start to emerge. I almost got tears in my eyes just hearing her say that. This means that she thinks he'll have speech – that it's going to come in due time. Oh, how I love to hear him running around the house saying, "Mom! Mom! Moooom!" I know I'm getting ahead of myself, looking too far into the future when I should be focused on the present. So, for now, I'm going to revel in the glory of oranges. Me: Elijah! Get your mouth off of the cart! Cashier: Oh, is he teething? Cashier: How old is he? Cashier: (trying to get Elijah's attention) Hi! Another employee: Is he sleeping?! Employee: Oh, I thought he was sleeping. That would've been so cute if he was sleeping in the cart like that. Going out in public can be difficult sometimes when you're a parent to a child with "special" needs. For one thing, you're going to see other kids your child's age who do things that your child cannot (yet) do and at times it cuts right through to your heart. It shoves any denial you may be harboring into your face and makes you confront it. "Look Lisa!" it says, "He's delayed! Look at what that five month old is doing! Look! Look! He can't do that!" Now, most of the time this is okay and you can smile at all the babies and their amazing development. But, on your bad days, an outing can make you want to crawl into a cave and cry. The other thing you encounter is unsolicited comments, like the ones I wrote above. The ladies I talked to today were nothing but pleasant and I enjoyed talking to them, but their comments showed me that people are starting to notice that Elijah is different from his peers - and I realize it's only going to become more obvious as time passes. I think if I had a nickel for every time someone asked me if Elijah was sleeping, I'd have about five dollars. (Ha!) Going to a store is really overstimulating to Elijah. The florescent lights, the influx of activity, and all the people make it difficult for him to focus or see anything. Imagine looking at a busy wallpaper and trying to focus on something complex in front of it - that's kind of what it's like for Elijah. He hangs his head, he avoids eye contact...and people assume that the little man is sleeping or tired. People also assume that Elijah is younger than he is. He looks smaller because his head is small and he doesn't interact like most twenty-one-month-old children. They assume that he's younger and don't realize that he has special needs. It's when they start asking questions that they start to wonder. No one gives you a instruction manual on this. Sometimes telling strangers that your child has cerebral palsy is really hard, because pain is in those words. This is something I don't think the general population understands - it sometimes hurts to admit that your child has a disabiltiy -even if you've come to terms with it and even if it's obvious to those around you. You want people to notice what is awesome about your child, not the things in which our society deems as "special." Often, strangers don't get to see Elijah's smile or hear his infectious laugh and they have no idea the battle he has fought in this life thus far. I'm learning. At times, I hear myself talk to people with ease. 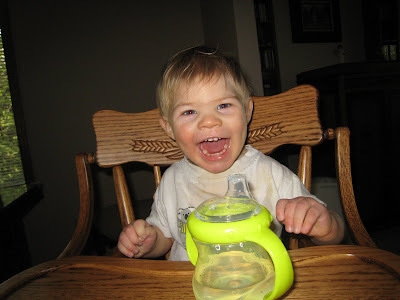 I explain that our little guy has cerebral palsy and I can hardly believe that I'm really saying that. I want to be able to answer any questions about our little guy with honesty, positivity, and grace. I know it's going to take practice. But sometimes I want to be just another mom out with her son on an errand. Is that too much to ask? In honor of Elijah's twenty-first month birthday, he got his first professional haircut. Oh, he looks so grown up now. And handsome. I'm not partial at all.